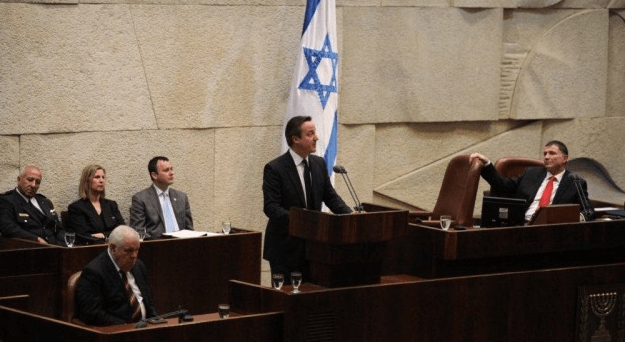 Nothing more exemplifies the historical whitewash of British rule in Palestine between 1917 and 1948 than the response (or lack of) to David Cameron’s speech in the Israeli Kneeset in March 2014. Therein he briefly propounded the much overlooked fact that Britain was the main western supporter of the Zionist colonial experiment in Palestine from the very beginning. Not one commentator in the UK, critical or otherwise, latched on to this crucial point. Presumably, it’s far less taxing on one’s moral conscience to emulate American, Arab and even Israeli commentators on the current Palestinian situation than face up to your own government’s historical criminal culpability – a culpability which Cameron drew attention to at the Knesset of all places? Obviously, Cameron naturally never outlined how Britain ‘secured’ the homeland for the Jewish people. However, it was in these years, i.e. 1917-1948, that the “only democracy in the Middle East” as Zionist propagandists lovingly refer to their colonial project was secured by Britain by first, denying Palestinians representative democracy which would have inevitably limited colonial immigration to their country. Secondly, when the first Palestinian uprising finally exploded in 1936 it was the British that led the repression against the Palestinian resistance and in doing so, also educated the nascent Zionist-settler forces on how to military crush and oppress the indigenous population. As Churchill strongly implies the Zionist project with its attendant occupation and ethnic cleansing of Palestine, i.e. the Nakba, had nothing to do with Jewish history as discovered by the so-called ‘Palestine Exploration Fund’ and everything to do with racist colonialism backed by the power of the foreign policy of an Empire that has escaped accountability for its role in this ongoing tragedy. Laleh Khalili, “The Location of Palestine in Global Counterinsurgencies”, International Journal of Middle East Studies, Vol. 42, Issue 3, pg. 413-433 and Matthew Hughes, The Banality of Brutality: British Armed Forces and the Repression of the Arab Revolt in Palestine, 1936-1939, English Historical Review, 124 (2009). Ghassan Kanafani, ‘The 1936-39 Revolt in Palestine’, Tricontinental Society, London, 1980, pg. 30.